اسکوئی, بهروز, دریجانی, مهرداد. (1391). مدل‌سازی و برگردان دوبُعدی داده‌های مغناطیسی منطقه شهمیرزاد استان سمنان به‌‌منظور تعیین عمق و شکل کانسارهای آهن. مجله ژئوفیزیک ایران, 6(3), 72-82. بهروز اسکوئی; مهرداد دریجانی. "مدل‌سازی و برگردان دوبُعدی داده‌های مغناطیسی منطقه شهمیرزاد استان سمنان به‌‌منظور تعیین عمق و شکل کانسارهای آهن". 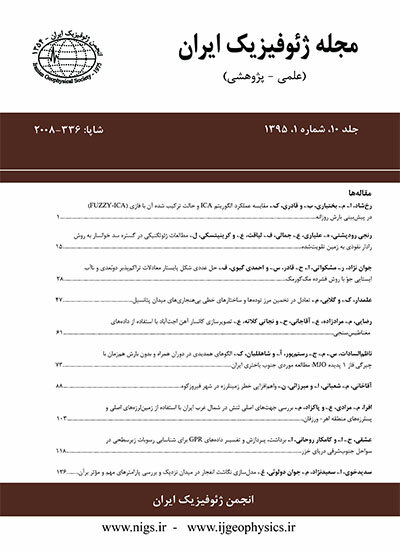 مجله ژئوفیزیک ایران, 6, 3, 1391, 72-82. اسکوئی, بهروز, دریجانی, مهرداد. (1391). 'مدل‌سازی و برگردان دوبُعدی داده‌های مغناطیسی منطقه شهمیرزاد استان سمنان به‌‌منظور تعیین عمق و شکل کانسارهای آهن', مجله ژئوفیزیک ایران, 6(3), pp. 72-82. اسکوئی, بهروز, دریجانی, مهرداد. مدل‌سازی و برگردان دوبُعدی داده‌های مغناطیسی منطقه شهمیرزاد استان سمنان به‌‌منظور تعیین عمق و شکل کانسارهای آهن. مجله ژئوفیزیک ایران, 1391; 6(3): 72-82. از مدل‌سازی و برگردان دوبُعدی داده‌های مغناطیسی برای تعیین عمق، شکل و ماهیت کانسارهای آهن استفاده می‌شود. در این مقاله از برنامه رایانه‌ای MAG2D در محیط مَت‌لب برای مدل‌سازی و برگردان داده‌های صحرایی استفاده شده است که بر‌‌اساس الگوریتم کمترین مربعات عمل می‌کند و یک وزن‌دهی براساس توزیع خودپذیری مغناطیسی با عمق دارد (استوکو و همکاران، 2009). روش ماسک سیگنال برای تمرکز عمل برگردان روی سیگنال بی‌هنجاری اصلی برای کاهش اثرات نوفه به‌کار رفته است. در این مقاله با مدل‌سازی و تکرار فرایند برگردان روی داده‌های مغناطیسی منطقه شهمیرزاد و استفاده از روش ماسک سیگنال، می‌توان یک بی‌هنجاری شیب‌دار را در محدوده میانی نیم‌رخ‌‌ها به ضخامت تقریبی 10 متر و به طول تقریبی 100 متر که از سطح زمین تا اعماق امتداد یافته است را مشاهده کرد و با توجه به مطالعات زمین‌‌شناسی در منطقه می‌توان به ماهیت هماتیتی این کانسار آهن پی‌‌برد. Geomagnetism has always been at the forefront among the various branches of geophysics. In geomagnetics, we have different methods for estimating the depths and shapes of the magnetic bodies in data interpretation. One of the essential and significant methods to describe the geological complexity of earth’s crust is modeling of magnetic data by inversion. Modeling and inversion of the total magnetic field and its compliance with the basic principle to minimize the cross-sectional area of the source bodies are described. The software code, with an interactive graphical interface, operates in MATLAB environment. The code of the inversion procedure is based on a least-squares algorithm, according to a criterion of balancing the weight of the data inaccuracies and the compactness of the solution. The interpretation of magnetic data can sometimes involve two steps, calculation of the direct problem (forward modeling) and solution of the inverse problem (inversion). Forward modeling allows one to compute the theoretical response due to the magnetic source bodies, assuming some hypothesis on the shape and the volume of the magnetic body and the susceptibility contrast between the body and the hosting environment. The analytical solutions to these problems are usually given for bodies of simple shape and regular geometry. The inversion procedure considers the observed profile data or gridded data and using an optimization procedure, estimates the distribution of the susceptibility, shape and volume of the buried magnetic bodies. The principle of the compact inversion involves minimizing the area of the source body, which is the same as maximizing its compactness. Since most of the cases we deal with are slightly underdetermined problems, we need to solve the inversion problem using the least-squares method. The method consists of an iterative procedure in which the weighting matrices change in each iteration until a satisfying convergence of the solution is obtained. The input parameters for the inversion procedure are: (1) the maximum number of iterations, (2) the maximum allowed value of the susceptibility contrast, (3) the noise-over-signal ratio (The model resolution is greatly affected by the choice of the parameter of N/S). The choice of the iteration which offers the best fit is driven by the minimum norm between the calculated and experimental data. A quasi-automatic selection of the signal segments that could be considered as carrying information on the targets was proposed (mask signal). We derived the inversion operator on those parts of the signal that we called ‘‘useful signal’’, i.e. the main anomalies. In this study, we provided a method for magnetic data inversion to make 2D susceptibility models of an area with a suitable potential of Iron-ore. We made use of a 2D inversion method to study the magnetic data of Shahmirzad located in Semnan Province in Iran, to evaluate the hematite mineralization in the area. After data acquisition and processing, we applied an automatic 2D inversion to two profiles. This algorithm was based on the physical parameter distribution method. The subsurface beneath the profile was divided into a great number of infinitely long horizontal prisms with unknown susceptibilities. Solving an underdetermined system of equations in MATLAB resulted in a magnetic susceptibility distribution inside the earth which was related to the hematite content of the rocks. Inversion results on the selected profiles have shown some anomaly sources with trending east-west strike. Finally, after the modeling and inversion and applying the mask signal method to two profiles of Shahmirzad magnetic data, the models showed a steep anomaly in this region with an average thickness of 10 m, a depth of approximately 5 to 25 m and 100 m long. This iron-ore contains hematite mineral with a susceptibility of 0.05, located in the middle of the area of study between igneous intrusive masses and the sediments of limestone. Cooper, G. R. J., and Cowon, D. R., 2006, Enhancing potential field data using filters based on the local phase: Computers & Geoscience, 32(10), 1585-1591. Fedi, M., Primiceri, R., Quarta, T., and Villani, A. V., 2004, Joint application of continuous and discrete wavelet transform on gravity data to identify shallow and deep sources: Geophysical J. Int., 156(1), 7-21. FitzGerald, D., Reid, A. A., and McInerney, P., 2004, New discrimination techniques for Euler deconvolution: Computers & Geoscience, 30, 461-469. Last, B. J., and Kubik, K., 1983, Compact gravity inversion: Geophysics, 48, 713-721. Li, Y., Oldenburg, D. W., 1996, 3-D inversion of magnetic data: Geophysics, 61, 394-408. Menke, W., 1984, Geophysical Data Analysis: Discrete Inverse Theory: Academic Press Inc., San Diego, Colifornia, 285pp. Namaki, L., Gholami, A., and Haﬁzi, M. A., 2011, Edge-preserved 2-D inversion of magnetic Data; an application to the Makran arc-trench complex: Geophysical J. Int., 184(3), 1058-1068. Stocco, S., Godio, A., and Sambuelli, L., 2009, Modelling and compact inversion of magnetic data: A Matlab code: Computers & Geoscience, 35, 2111-2118. Telford, W. M., Gedrat, L. P., and Sheriff, R. E., 1990, Applied Geophysics: Cambridge University Press, Cambridge, UK, 512pp.